A new Homeland Security Department program promoting agile software development has hit a stumbling block. INTEGRITYOne Partners, Harmonia Holdings Group, Cybermedia Technologies, Brillient Corp., Citizant, Ventera Corp., Incentive Technology Group and BC Digital Services filed protests with the Government Accountability Office. More here, including details on a previous agile effort by the Department of Homeland Security (DHS). And according to the article, it is anticipated that the demands of the incoming Trump Administration will spur further efforts in this vein. Since walls are really cool these days, especially if someone else pays for them, I figured that I'd talk about them. But I'm going to talk about a different type of wall - a logical wall that can be erected between two companies, or even between two parts of the same company. Let me jump back to 2008, and to a personal example. In late 2008, I was working for Motorola's Biometric Business Unit when I learned that Motorola wanted to sell this unit to a company called Safran - pending government approvals. Now some would expect that once the announcement was made, all of the Motorola employees and all of the Safran employees would all get together and start talking about how things would work once the deal went through. As Donald Trump would say, "WRONG!" All of us Motorola employees were strictly cautioned that the deal might go through, or it might not. Until the deal actually went through, we were to consider Safran employees as competitors, just like we always had. I had no idea what the Safran employees were told - again, I wasn't talking to them - but presumably they were told the same thing. In fact, during the next few months, Motorola and Safran actually submitted competing bids for several opportunities, continuing the fierce competition month after month after month. Several months passed, and the deal wasn't finalized yet. It was probably February 2009 when I went to a conference at the National Institute of Standards and Technology - a conference that was also attended by a Safran employee. During a break in the proceedings, the Safran employee and I had a conversation. It went something like this. I heard that the deal may get done this month. That's what I heard too. Of course, I previously heard that the deal might get done LAST month. Yeah, that's what I heard too. As it turned out, the deal didn't get done in February. Or in March. Finally, on a day in early April, we at Motorola officially heard that we no longer worked for Motorola any more (and could you kindly give us our batwings back please?). Only after that could all of us work on the reorganization. Fast-forward to the Verizon-Yahoo deal - which like all deals of this type, may or may not happen. With the most recent revelations about a billion Yahoo accounts being hacked, the chance of the deal not happening is increasing. So Verizon has to plan for the possibility of acquiring Yahoo, and thus getting confidential information about how Yahoo operates. At the same time, Verizon has to plan for the possibility of not acquiring Yahoo, and needs to consider the ramifications of the purchase WITHOUT access to that confidential information. So how is Verizon doing this? By creating two separate teams and walling them off from each other. While a Verizon group led by AOL Chief Executive Officer Tim Armstrong is still focused on integration planning to get Yahoo up and running, another team, walled off from the rest, is reviewing the breach disclosures and the company’s options, said the person, who asked not to be identified discussing private information. This is different from the wall that was enforced between Motorola and Safran between 2008 and 2009. In the earlier case, we were talking about two separate companies. In the Verizon case, we're talking about walling off two different groups WITHIN THE SAME COMPANY. As it turns out, I've actually had experience with walls within a company. But that's a Motorola trade secret. One that I'm not allowed to disclose to Safran. There are many, many disagreements between businessman-turned-President Donald Trump and his opponents. But there is one thing upon which both of them agree. Both agree that he is an extreme narcissist - or, as Trump himself would put it, the most amazing narcissist ever. As President-elect Trump keeps himself busy with Cabinet appointments, thank you tours, television executive producing duties, and Twitter, his opponents are apoplectic, preparing for the end of the world. I said above that Trump would also declare HIMSELF to be an extreme narcissist. I don't know if any journalist has ever directly asked him the question, but think about it. Would he respond to the "Are you a narcissist" question by saying that he's humble? I think not. Jeffrey Kluger, co-author of Apollo 13 (a/k/a Lost Moon) and author of the more recent book The Narcissist Next Door, addressed this very question in a listicle of facts about narcissists. 4. One of the best ways to determine if a person is a narcissist is to ask them if they are a narcissist. They will often say yes. "In the case of a narcissist, it's often because what they're saying is 'Well yeah, if you mean do I have a high opinion of myself, I do, but that's because gosh I'm the best person I know. I deserve to have a high opinion of myself,'" Kluger said. The most shocking thing about the [event] ... was [politician's] complete obsession about [self]....[Politician's] performance is a case-study in malignant narcissism with all the attendant paranoia and disturbing inability to consider other ... human beings at the center of the [event]. Psychologically speaking, [politician] is what is called a “malignant narcissist.” ... A “malignant” narcissist ... is a narcissist who reacts sadistically to others who don’t support and enable their narcissism. For example, instead of self-reflecting and taking in critical feedback, the [politician's staff] reacts with ruthless contempt for anyone who disagrees with them. Like a mean and cruel-spirited malignant narcissist, [the politician's staff] deny the accusation and try to destroy the messenger. Ultimately, a malignant narcissist wants to annihilate anyone who in any way threatens their illusory self-image and self-serving agenda. I feel that my role as a former president is probably superior to that of other presidents. Primarily because of the activism and the – and the injection of working at the [major organization] and in [a list of issues]. We’re right in the midst of the – of the constant daily debate. These quotes respectively refer to Trump's opponent Hillary Clinton, and to Presidents George W. Bush and Jimmy Carter. Maybe she is more than a president. Maybe she is an idea, a world-historical heroine, light itself. The presidency is too small for her. She belongs to a much more elite class of Americans....Hillary Clinton did everything right in this campaign, and she won more votes than her opponent did. She won. She cannot be faulted, criticized, or analyzed for even one more second. Instead, she will be decorated as an epochal heroine far too extraordinary to be contained by the mere White House. Narcissists, by their very force, can be captivating, and while Clinton, Bush 43, Carter, and Trump all have their enemies, they also have admirers. But none of these hold a candle to the REAL narcissists who have resided in the White House. The Pew Research Center rated the narcissism of all of the Presidents from Washington to George W. Bush - and while the methodology of any such study can be questioned, it's probably fair to say that the people at the top of the list were/are more narcissistic than the people at the bottom of the list. So, who topped the list? Compared to the people at the top of this list, Trump is a nobody. Imagine Trump trying to say "You're fired" to Lyndon Johnson, Theodore Roosevelt, or Andrew Jackson. Lyndon would crush Trump's anatomy, Teddy would batter him with a big stick, and General Andy would shoot him faster than Indiana Jones. It also helps to praise narcissists for being so wonderful - something that Vladimir Putin apparently knows very well. There is a chance that Donald Trump may become President of the United States! Does this sound like old news? Well, how about this piece, dated November 30 (yesterday), from Sean Martin of the Daily Express? This means that satellite signals will struggle to penetrate the swollen atmosphere, leading to a lack of Internet service, GPS navigation, satellite TV such as Sky and mobile phone signal. Obviously this would have huge implications for our modern world - and we have less than four years to prepare! According to Martin, this prediction was made by Pete Riley of Predictive Science. And you know he's a scientist because of his URL - http://www.predsci.com/~pete/ is your typical UNIX-like user name. We're not dealing with a DOS guy here. So I went to the Predictive Science website and searched for a recent report detailing Riley's prediction - and couldn't find one. This seemed odd, so I kept on poking around until I found this article - FROM 2012. Pete Riley, a senior scientist at Predictive Science in San Diego, told Gizmodo that there is roughly a 12% chance that the Earth will experience an enormous megaflare within the next ten years. "Even if it's off by a factor of two, that's a much larger number than I thought," said Riley. Riley published his prediction in Space Weather: The International Journal of Research and Applications. So Martin basically resurrected a four year old story. And how is the respected press covering it? According to Express, senior scientist, Pete Riley of Predictive Science in San Diego, California said that the chance of huge solar storm by 2020 is high. Modern-daay researchers have warned that there is a 12 percent chance that a solar storm will smash Earth in the end of this decade. This powerful event will be as big as the Carrington event which occurred in 1859, according to Express UK. As reported by the UK’s Express , experts believe there is a one in eight chance that earth will be hit by a major solar storm before 2020, which would wipe out nearly all technology that is not hardened against EMP events – so, pretty much every piece of technology that is not owned and operated by governments. Great scoop, Express. But what will you do when someone scoops you in 2018 and doesn't reference your "work"? And as for Predictive Science itself, it only offered this comment. Obviously Predictive Science doesn't put a lot of stock in Twitter. After all, USENET is just fine for scientific discussion. Nothing new on the Oleg Atbashian front, and perhaps nothing new there until February. But the country of Canada, which doesn't claim George Mason as a Founding Father, is having its own issues with the Students for Justice in Palestine. Let's start with a piece from the independent newspaper for Ryerson University. The paper is called The Eyeopener. More than 200 students filled the Library Building’s lecture hall for the Ryerson Students’ Union (RSU) Semi-Annual General Meeting (SAGM) on Nov. 29. After many amendments to the order of the agenda, three motions were voted on (not including the RSU’s financial audit report for the 2015-2016 year, the agenda and meeting minutes). Quorum was lost just under four hours into the SAGM and the meeting was adjourned. The remaining 16 motions were pushed to the RSU’s next board meeting. RSU president Obaid Ullah said the meeting will take place before the winter break. Well, four hours is a long time, so it's understandable that students lost interest. Maybe that Bullard comedian has a new show on Canadian TV or something, and they walked out to watch it. Actually, The Eyeopener targets the exact moment when the quorum was lost. A motion was brought forward detailing plans for the RSU to have a Holocaust Education Week. An amendment was proposed to make the education week include education about all genocides and not just the Holocaust specifically. However, quorum was lost before a vote could be made. Hmm, that's kind of odd. You'd think that people would stick around to talk about something like that, Israel and Palestine being in the news and all. Local members of Students for Justice in Palestine and the Muslim Students Association reportedly staged the walkout Tuesday night during the semiannual general meeting of the Ryerson Student Union. The resolution, which was submitted by a member of the Ryerson Hillel Jewish students’ group, called on the Student Union to offer annual Holocaust education programs to emphasize “the value of pluralism and the acceptance of diversity.” There was no mention of Israel. The unfortunate outcome for SJP and MSA is that Ryerson can now be painted as an anti-pluralistic, anti-diverse, Holocaust-loving university. Time Warner, CBS, and everyone else, I want you to pay ME to watch your stuff. But you'll claim that's unreasonable. Well, why should I have to pay YOU so that you get the privilege to air commercials in my home? Shouldn't you be paying me so that I will become part of your audience? Even if you don't go that far, you have to ask - why do you potentially spend hundreds of dollars a month for cable/satellite programming...and then have to sit through commercials on top of that? Well, this double-dipping into your pocketbooks extends beyond the visual realm. The Newspaper.com has taken a break from its regularly-scheduled coverage of speed camera vandalism to address another automotive issue - Sirius/XM programming. SiriusXM has become — as far as content — terrestrial radio you have to pay to listen to. It is not possible to listen to pretty much any talk channel except Howard (Stern) for more than about 10 minutes without enduring the commercial juggernaut. And as TheNewspaper.com writer Eric Peters notes, there are plenty of alternatives to Sirius/XM programming - not only free radio, but also podcasts and streaming services. Doing business with the government - guess who has the power? While a number of companies (including my employer) do a lot of business with national, state, and local government agencies, other companies would just as soon not bother to do so. Because of red tape and low profitability, it's easier for them to do business with non-governmental customers. And even those whose products are of particular interest to governments may have a hard time selling to the government - or may have a hard time AFTER selling to the government. The whole "merchant of death" thingie arose when Alfred's brother died and a newspaper, thinking that it was Albert who had passed, wrote in an obituary that Alfred made it possible to kill many people very quickly. One of Albert Nobel's killing inventions was something that he called ballistite. This product, which didn't emit as much smoke as most other products of the time, was something that could be sold in the militarizing Europe of the 1880s. Since Nobel was living in France at the time, and had lived there for decades, he offered the product to the French government. However, the French were already doing buiness with a French chemist named Paul Vieille who had developed his own non-smoky product, so they didn't want to buy Nobel's invention. Shut out of his (adopted) home market, Nobel successfully sold the product to the (relatively new) Italian government. After a factory was set up near Turin and 300 tons of ballistite was produced, the Italians asked to purchase the patent itself. Nobel sold it. These actions did not sit well with France. So what, one may think. Let's say that Nobel had invented some type of gun, and that he first tried to sell it to Remington. Remington didn't want it, so Nobel sold it to Smith & Wesson. The product takes off, and Remington kicks themselves for missing out on an opportunity. But things get a little tricky when the losing party is a government, and the winning party is a competing government. And Nobel, living in France, began to have a few problems. An ugly press campaign aimed at discrediting Nobel was started. Among other things, he was unjustly accused of espionage, threatened with imprisonment, and his license to conduct experiments in France withdrawn. And where did he move? In our corporate lives, many of us have to spend time reading standards, and if we're not reading standards, we're at least adhering to them in some way. For example, right now I am using a keyboard that works with an operating system, an application (Blogger), and eventually a browser or email program (whatever one you're using to read this) - and all of them are familiar with one or more character formats, such as ASCII or Unicode. If my operating system suddenly decided to support some other character format, the whole thing would fall apart. But when reading this specification, I was struck by a particular section. Now why, oh why, would a specification make a big deal about how an acronym is pronounced? The PNG format provides a portable, legally unencumbered, well-compressed, well-specified standard for lossless bitmapped image files. Although the initial motivation for developing PNG was to replace GIF, the design provides some useful new features not available in GIF, with minimal cost to developers. Ah, GIF. The sordid tale of GIF, LZW, CompuServe, Unisys, patents, and fees has been told many times. Check this or this or this for further information. All of this ended over a decade ago, however, so it's not of real concern. But there's one concern about GIF that remains to this day - I saw it erupt on Facebook earlier this week. The reason that the creators of PNG specified its pronunciation is because the pronunciation of GIF spawned wars that even a group of patent attorneys couldn't resolve. Take this video that shows what happened when Steve Wilhite of CompuServe fame won a Webby Award. Yet hard G people still fight the fight today. But at least the pronunciation of PNG is settled, isn't it? Well, I've already seen one disagreement. Before returning to our discussion about Oleg Atbashian, freedom of speech (and of the press), and the felony charges against Atbashian, I'd like to go off on a tangent about nuclear war. The excerpt below is from something the American Conservative published in 2013. DEFCON is short for DEFense CONdition, and according to the Encyclopedia of the Cold War, “The DEFCON system is divided into five different alert levels with detailed, if ambiguous, descriptions and expected actions by military forces at each threat level.” Mr. Deace’s first error is that DEFCON scales from 1 to 5, not 6. To be charitable, though, he likely knew this and was making an exaggerated claim for effect. What then, is DEFCON 5? Again from the Encyclopedia of the Cold War, “DEFCON 5: Normal peacetime readiness The lowest alert level in the DEFCON system…” DEFCON 5 is as low as alerts go, and is the traditional status for most military forces. Anytime someone threatens to go DEFCON 5 on you or a loved one, then, readily take them up on their offer as amity should shortly be restored. Alert is raised from there with progressively lower numbers. Deace isn't the only one who is confused about the DEFCON numbering system. Heck, most all of us, including myself, usually assume that bigger numbers mean a greater threat. Since they couldn't find any weapons and our message was protected by the First Amendment, the officers decided to charge us with "destruction of property worth of at least $2,500," which was a "class 6 felony." As you can see, the right wing media is NOT lying in this case. Atbashian is charged with destruction of property, with a complaint filed by M. Guston, and the charge is a class 6 felony. Which of course raises the question - what is a class 6 felony? A Class 6 felony in Virginia is a crime that meets the criteria for the "felony" category with the least of authorized punishments associated with it. Class 6 felony crimes in the state of Virginia include reckless endangerment and violation of a court order. So if any patriot declares that the state should "reduce" Atbashian's crime to a class 1 felony, the patriot doesn't know what he or she is talking about. So what's the penalty for a class 6 felony? Penalties for the commission of Class 6 felony crimes in Virginia include imprisonment of no less than one but up to five years. Fines that do not exceed $2,500 can also be imposed on those who commit Class 6 felony crimes in Virginia. This type of crime would result in at least six months of jail time with a minimum of 30 days served. It all depends upon what the Fairfax County prosecutor wants to do. Because of the First Amendment issues, there's a chance that the prosecutor may even settle for time served (14 hours). And obviously Atbashian's defense attorney will have some influence over the final outcome. Stuart A. Sears joined the law firm Schertler & Onorato, LLP, as Counsel in 2013 and was promoted to Partner in 2014. He is an experienced and accomplished trial attorney whose practice focuses on criminal and white collar defense. Stuart’s litigation experience includes representation of individuals in a wide array of federal and state criminal proceedings, including cases involving charges of health care fraud, false claims, money laundering, mail and wire fraud, illegal structuring, and mortgage fraud. He has extensive trial and post-conviction litigation experience in Virginia, Washington, D.C., and the federal courts. In addition to his trial work, Stuart’s broad experience includes representations of individuals and companies in civil and criminal government investigations. He has recently counseled clients through Department of Justice (DOJ) investigations involving the Foreign Corrupt Practices Act (FCPA), the False Claims Act (FCA), procurement fraud, and health care fraud. Stuart’s practice also includes litigating complex criminal and civil forfeiture matters at the agency and district court level. Not sure if any of Sears' prior clients were people who put up satirical posters, but this will certainly round out his experience. I haven't told you everything about the National Students for Justice in Palestine conference at George Mason University. In addition to the conference, and the demonstrators at the conference, and the people who wanted everyone to be in a safe space, there were two more people roaming around campus. One of these people was Oleg Atbashian. You may have heard of Atbashian without realizing it. Oleg Atbashian came from the Ukrainian Soviet Socialist Republic, and reputedly did some artwork there for the local benevolent government. Atbashian eventually made his way to the United States in 1994, where he eventually exercised his satirical event with groups such as Communists for Kerry. Eventually he devoted his efforts to The People's Cube, where he authored a piece on Snopes' founders in 2015. The piece begins as follows. LOS ANGELES, CA - Snopes.com owners Barbara and David Mikkelson were detained by police today after an unrelated investigation of a Snopes.com editor lead police onto a paper trail of corruption, bribery, and fraud at the very heart of the fact-checking organization. Evidence obtained by police has revealed that Snopes.com, which markets itself as "the definitive Internet reference source for urban legends, folklore, myths, rumors, and misinformation," has a history of accepting money and favors from left-leaning and pro-Islamic political groups and individuals for helping them to advance their cause by rigging public discourse with selective fact-finding and deliberate manipulation of public opinion. Late Monday morning, Brian Williston, a Snopes.com editor, who also doubles as the accountant, found himself at a flea market on the outskirts of Los Angeles. As he was browsing the different tables and tents looking for antiques, an old mechanical piano began playing Dixie's Land, a song that was adopted as a de facto anthem of the Confederacy during the American Civil War and is now considered offensive by some due to its link to the iconography and ideology of the Old South. The tune sparked an outrage in Williston, who began yelling and cursing those who "would like to bring back slavery and racial separation," and ordering the vendors to "turn off that racist music." The piece goes on from there, and was enjoyed by many - for various reasons. It turns out that some people who enjoyed the piece don't realize that it's satire. Snopes CEO was arrested on fraud and corruption charges last year! People will continue to rely on Snopes for “the truth”. I’ve been telling people about this bias for years. It needs to be broadcast far and wide. But Oleg Atbashian didn't see anything funny about the National Students for Justice in Palestine, and he decided to...Fight Back. Whoops, wrong David Horowitz. There's a David Horowitz that runs the David Horowitz Freedom Center, and Atbashian agreed with Horowitz's views about the SJP. Atbashian decided to design a poster for the National SJP Conference. 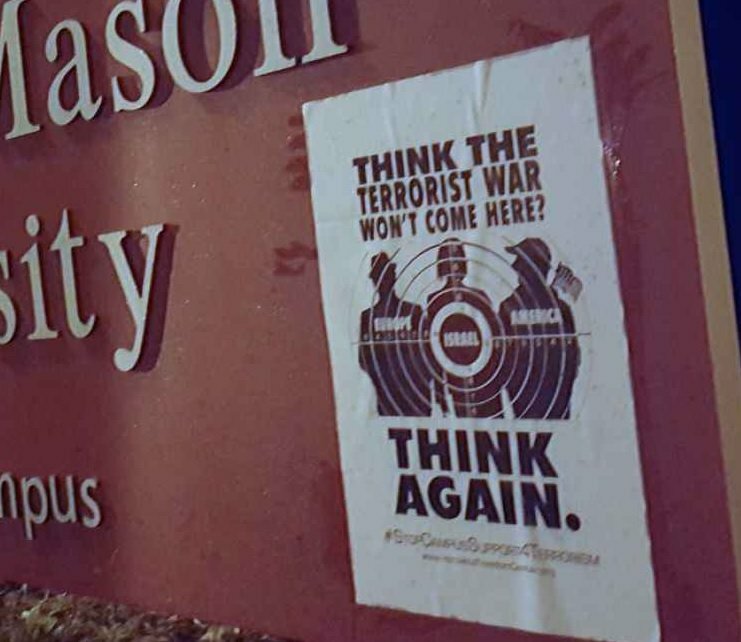 This was supposed to be a two-day poster campaign, to counteract the George Mason University hosting an official national conference for Students for Justice in Palestine (SJP), which is an anti-Semitic organization with well-documented ties to Hamas - a terrorist group whose stated goal is to exterminate the Jews. The GMU poster campaign was conceived by the David Horowitz Freedom Center. They were taken off campus...and straight to jail. The magistrate's decision was quick: $8,000 bail for each of us and a mandatory court hearing within several days. As we were led away to be processed into the system, Officer Guston said, somewhat triumphantly, his final words to us: "You can't come to GMU ever again." Let's pause here for a minute. The First Amendment to the Constitution, the same amendment that discussed George Mason's beloved freedom of the press, also talked about freedom of speech - specifically saying that Congress could not restrict it. As a public university, George Mason University is bound - or should be bound - by that same amendment. Yet Officer Guston believed that a satirist was not protected by that amendment. Some people are concerned by this. Others are not. 14 hours later, the two were out of jail, involved in a hassle with their rental car company, their hotel, and their airline that cost them some money. But now their story is out, and it's being treated differently by various sections of the media. The mainstream media, to my knowledge, has been silent on the issue. The left-wing Silicon-Valley controlled Washington Post hasn't covered the story, and the right-wing Moonie controlled Washington Times hasn't covered it either, despite the fact that this is a local story. Either these people are trying to sell clicks by, um, trumping up the worst-case scenario, or they truly believe that Atbashian will spend five years in a Virginia prison. Either way, it's...um...deplorable. The student organization Students for Justice in Palestine (SJP) is prominent on many college campuses, preaching a mantra of “Freeing Palestine.” It masquerades as though it were a civil rights group when it is not. Indeed, as an African-American, I am highly insulted that my people’s legacy is being pilfered for such a repugnant agenda. It is thus high time to expose its agenda and lay bare some of the fallacies they peddle. • If your heroes are clerics who sit in Gaza plotting the genocide of a people; who place their children on rooftops in the hopes they will get blown to bits; who heap praises upon their fellow gang members when they succeed in murdering Jewish school boys and bombing places of activity where Jews congregate—you do not get to claim that you are some Apollonian advocate of human virtue. You are not. And she continues, claiming that certain freedom fighter of the past would find the SJP to be abhorrent. Rosa Parks was a real Freedom Fighter. Rosa Parks was a Zionist. Coretta Scott King was a Zionist. A. Phillip Randolph was a Zionist. Bayard Rustin was a Zionist. Count Basie was a Zionist. Dr. Martin Luther King Sr. was a Zionist. Dr. Martin Luther King Jr. was a Zionist. Indeed, they and many more men and women signed a letter in 1975 that stated: “We condemn the anti-Jewish blacklist. I wonder what George Mason would have said, had he lived to see this. In this second post, I'm going to fast forward 225 years or so, to a university in Fairfax, Virginia called George Mason University - named after the George Mason that I previously discussed. This is a public university, part of the Virginia public university system. In the spirit of its namesake, it declares itself to be inclusive and accessible. Any university that is inclusive is bound to have a very broad range of interests, and the challenge to any university is the need to allow all of those interests to be represented. And this challenge was certainly faced earlier this month, when the George Mason University Students for Justice in Palestine hosted the SJP's National Conference. IT'S HERE AND IT'S HAPPENING! Announcing the 2016 National SJP Conference on November 4th-6th, hosted by George Mason University Students Against Israeli Apartheid (SAIA) in Fairfax, VA and the DMV! Our theme this year is "Critical Mass: With Our Roots in Resistance, Forging a Just Future." Let your fellow SJP members know to RSVP on this page and to share! This will be the inaugural NSJP conference following the introduction of the new national structure. The conversations we have will be important and pertinent to the student movement, so we want to see as many faces as possible! Let's keep growing and building together as we strive for a free Palestine. See you soon! Now perhaps this may surprise some people, but not all university students are enthused about the SJP's goals. And some people outside of the university are not enthused either. What? People outside of George Mason University are weighing in on an event taking place at the university? Well, doesn't that make them - OUTSIDE AGITATORS? You know, those people who don't know their place and stick their noses in other people's business. In 1958, George Wallace ran against John Patterson in his first gubernatorial race. In that Alabama election, Wallace refused to make race an issue, and he declined the endorsement of the Ku Klux Klan. This move won Wallace the support of the NAACP. Patterson, on the other hand, embraced Klan support, and he trounced Wallace in the election. When Plan A doesn't work, move on to Plan B. While Wallace didn't change parties like Donald Trump did, he changed positions on issues such as segregation, becoming (for a time) the George Wallace that we all know and hate. And during his initial terms as Governor, Wallace certainly had issues with outside agitators. Some people, however, disagreed with Wallace and thought that outside agitation was just fine. A few of them changed their minds, however, when Martin Luther King Jr. stopped outside agitating in the South and started outside agitating in places like Chicago. Fast forward to November 2016 and the National SJP Conference. Such a conference would attract attention of the press that George Mason himself so strongly championed, so Jonathan Bronitsky of Tablet sought press credentials. On a beautiful, cloudless, and unusually warm November morning, I went to the registration desk and asked SJP communications personnel for comment, but I was told that both organizers and attendees would only speak with “registered media.” I explained to a recent graduate from Tufts University, who was in charge of NSJP’s media email account, that I was a freelance journalist. I gave her my business card and pulled up my website on my iPhone to provide her with a sense of my writings. She was genuinely sympathetic, interested, and instructed that I apply for a credential through NSJP’s website. I did, but my application would soon be denied. The Tufts alumna had indeed explained upfront that approval was unlikely because my request was “the day of” and her organization was worried about infiltration and negative press. She specified that a “right-wing publication,” which had tried to link SJP with Hamas, also sought a credential. So the National SJP was stingy with its press credentials. Or was it? OK, not a problem. Bronitsky may not have been able to get inside the event, but he could certainly ask questions outside of the event - right? Shut out of the National SJP conference, Bronitsky went across campus and covered another event. Now if you were to conclude that the Jewish organizations on campus were all behind this demonstration, your conclusion would be incorrect. Now is this truly a freedom of the press issue? As I've noticed previously, Constitutional protections limit what the government can do, but do not limit what private organizations can do. In the same way that private citizen Donald Trump could yank press credentials on a whim, private organization SJP can refuse to grant press credentials on a whim. The fact that the event was held at a public university does not necessarily mean that private organizations using university facilities have to behave like a government. You know, I wonder if Donald Trump heads the National SJP. There are some parallels between the two that go beyond their attitudes toward the press. Both love Syria, for example. We have learned that offensive Islamaphobic signs were posted on campus yesterday by individuals unaffiliated with George Mason Hillel. George Mason Hillel condemns this act and any efforts to demonize any racial or religious group. We are committed to creating a campus climate where all feel safe and secure, where diversity is celebrated, and where political differences are communicated civilly and respectfully. Because George Mason is, after all, inclusive and accessible. Now these signs were not posted by the protesters cited above. They were posted by a DIFFERENT outside agitator. I plan to make a series of posts on the #empogmgmu topic, but a few warnings are in order before I begin. First, if you are a committed Clinton supporter who gets upset when people say mean things that make you cry, you may not want to read the #empogmgmu series of posts. Second, if you are a committed Trump supporter who gets upset when people say mean things that make you cry, you may not want to read the #empogmgmu posts either. In fact, perhaps it's best if no one reads the posts at all, and looks at puppy photos instead. Third, this post - or series of posts - is definitely NOT succinct. In part, its longish because it covers a lot of time - over 225 years. Although it doesn't cover a lot of geography. It begins at a plantation in Fairfax County by the Potomac River, and ends at a jail - I mean detention facility - not too many miles away from that plantation. Although perhaps by the time that I'm done with the #empogmgmu series, I will have gone beyond that detention facility. But let's go to the beginning, to a man named George Mason. Technically he's one of the Founding Fathers, but he's not a really cool Founding Father like Washington and Franklin and Madison. Why not? Because he ended up opposing the U.S. Constitution. Backing up a bit, when British North America was a collection of separate colonies, George Mason was a resident of the colony of Virginia. Born in 1725, Mason was a very rich man, and lived in a plantation called Gunston Hall (not too far from where another very rich man, George Washington, ended up living). Mason was active in politics in Fairfax County and in the nearby city of Alexandria, and then was elected to the Virginia House of Burgesses in 1759. He was part of the group of Burgesses who objected to the British government's actions in the colonies, and by 1776 he had authored the Virginia Declaration of Rights, which begins as follows. I. That all men are by nature equally free and independent, and have certain inherent rights, of which, when they enter into a state of society, they cannot, by any compact, deprive or divest their posterity; namely, the enjoyment of life and liberty, with the means of acquiring and possessing property, and pursuing and obtaining happiness and safety. If some of those words sound a little familiar, that's because another rich Virginian plantation owner, Thomas Jefferson, referred to the Virginia Declaration of Rights while writing the Declaration of Independence later in 1776. XII. That the freedom of the press is one of the greatest bulwarks of liberty and can never be restrained but by despotic governments. Basically, if I may use a modern term, Mason wanted Virginia to be a safe space where members of the press could function freely, without running into the issues that bedeviled John Peter Zenger. We'll get back to the Article XII a little later. After a number of discussions and compromises among the delegates, the body came up with a Constitution. And Mason, who had been one of the most active participants in the Constitutional Convention, decided that he could NOT support it. Mason's refusal prompts some surprise, especially since his name is so closely linked with constitutionalism. He explained his reasons at length, citing the absence of a declaration of rights as his primary concern. He then discussed the provisions of the Constitution point by point, beginning with the House of Representatives. The House he criticized as not truly representative of the nation, the Senate as too powerful. He also claimed that the power of the federal judiciary would destroy the state judiciaries, render justice unattainable, and enable the rich to oppress and ruin the poor. These fears led Mason to conclude that the new government was destined to either become a monarchy or fall into the hands of a corrupt, oppressive aristocracy. It turns out that Mason's objections were shared by others. The other delegates, though, rather than rejecting the Constitution altogether, decided to immediately amend the Constitution with some protections for individuals, many of which were derived from the Virginia Declaration of Rights - including its Article XII about freedom of the press. Mason died just a few years later, in 1792. Although he isn't necessarily remembered throughout the United States, he is remembered in the Fairfax County area of Virginia. At least two educational institutions were named in honor of Mason - Gunston Middle School (formerly Gunston Junior High School) in Arlington, Virginia, and George Mason University in Fairfax, Virginia. I attended Gunston back when it was a junior high school, but I never attended George Mason University. However, it is to George Mason University that we shall turn. The activities of one group in North Carolina have received attention from all of the media, the Republican Party, the Democratic Party, the Trump people, and all of us. When the day of the parade comes, protesters and media will swarm to the place to cover the story, and it will be emblazoned all over the news that evening. A Klan group in California came out to Anaheim earlier this year and got a similar amount of attention - for a protest with only a half dozen Klansmen. The North Carolina victory parade will be lucky if it gets more than 100 participants. The media (much less the protesters) will probably outnumber actual Klansmen. This phenomenon, where a group's influence is disproportionate to their actual numbers, is not limited to the alt-right, the alt-left, or other fringes. Take this protest against Russian bombing in Syria, in which the Telegraph dutifully reported the activities of the protestors - uh, protestor. In this case, I can't blame rt.com for not finding the incident to be newsworthy. There are numerous examples of viral reactions to limited civil disobedience - the one man facing a tank in China, various Buddhist monks who were on fire for their cause, and others. Some, such as Rosa Parks, were backed by organizations, while others went out on their own. But why do these people have such influence? It's not just the marketing - I could put out a press release loudly proclaiming that Brian Eno is Slim Whitman's secret son, and no one would give a hoot. But when the protest elicits emotional reactions - especially emotional reactions when the Klan, Putin, or other hot-button figures are involved - news of the protest will spread far and wide. Despite their deplorable image, the Klan are no dummies. They knew very well that a simple announcement of a public rally, even without accompanying details, would get the Klan a lot of free publicity. And as that publicity ricocheted around the world, perhaps that would be enough to motivate a guy somewhere to think, "Hey, the Klan really speaks for me." Once I saw that Empoprises opposed the Klan, I knew that the Klan had to have something worthwhile to offer me. I mean, Empoprises writes about Brian Eno - a foreigner. The Redcoats are almost as bad as the Yankees, in my opinion. Foster care does come with its challenges and I’ve learned a lot about myself. In one instance I cared for a little girl that couldn’t speak English, but we worked through it together. It was so satisfying to find a way to communicate with her and make a connection. Sometimes I think the biggest challenges have the biggest rewards. Kenneth Cole Productions, a fashion house and shoe company founded more than three decades ago, is closing almost all its stores, effectively ending its run as a U.S. brick-and-mortar chain. The New York-based retailer will shutter its 63 outlet stores over the next six months, Chief Executive Officer Marc Schneider said in an e-mail Friday. So Kenneth Cole is closing 63 stores. Perhaps this quote, later in the article, will explain why. “As we continue on our path of strengthening our global lifestyle brand, we look to expand our online and full-price retail footprint across the globe,” [Schneider] said. Now it's clear. It isn't that Kenneth Cole is closing 63 stores. It's that Kenneth Cole is closing 63 OUTLET stores. To some extent, I can write about whatever I want to on my blogs. For example, this is the first time that I have written anything about The Porch. My employer moved to a new building in the fall of 2015. I've written about the building, but haven't specifically written about The Porch - the term that I use to describe the second floor overlook in our building. Normal people would say that this overlook, and the large windows at the front of our building, give you an unobstructed view of our neighbors in the corporate park - not only Wescom, but also Micrometals and Calvary Chapel East Anaheim. But that's not how I describe it. As I put it, I can go out and stand on our porch and take a look over yonder and see the stuff across the road - the metal shop, the chapel, and the little old bank by the corner. I can grab me a cup of tea or coffee from the Flavia machine and just gaze out on the world. Heck, all I need is a rocking chair and I can just sit on The Porch all the time. Unfortunately, my preferred rocking chair vendor don't got no offices round here - I'd have to take the jalopy all the way to Kingman to get a genuine Cracker Barrel rocking chair. Currently operating at around 55 percent occupancy, Canyon Corporate Center is set to undergo an extensive capital improvement program aimed to boost leasing at the property. The new ownership will focus on turning the property into flexible, high-bay office space with open features such as skylights and large windows that will cater to companies looking for creative space. There's all sorts of construction now, and my formerly peaceful oasis has all sorts of scaffolding, temporary barriers to keep you from falling off The Porch, and construction workers scurrying around doing important stuff. I'm not sure how much longer the construction will take, but we'll see what things look like when it's all finished. And maybe I'll take one of those selfie things and show all of you the view of the metal shop, the chapel, and Liz's money place. I was searching for information on the unincorporated community of Santa Catarina, Texas and encountered this page. I suspect that Ignitium (which is actually based in Spokane, Washington) is engaging in a little search engine optimization by ensuring that any search for a town will eventually hit an Ignitium page. And I was right - Ignitium has thousands of pages in Texas alone. And in California, Ignitium has a page for Guasti. As you may know, Guasti is the official home of the Empoprises blogging empire (co-located with the Ontario Vineyard Village Association and KOER Synthetica Radio). So if my blogging empire is based at 1 Empire Way, Suite 2525, is Ignitium's Guasti office in Suite 1700 in the same building? And you don't have to worry about radon gas. And if you do die from radon gas, you will be remembered. I mentioned this on my Facebook Empoprise-BI page, but there's a slight chance that you didn't see this so I'll mention it again. As I've previously noted, the introduction of a new technology is often accompanied by grandiose claims by the technology's proponents. For example, when the World Wide Web expanded our worlds beyond the world of CompuServe, people imagined that this would allow us to access EVERYTHING. In such an environment self-styled "founts of all knowledge" (heh) could truly BE founts of all knowledge, since everything was just a mouse click away. This obviously affected brick and mortar businesses. Why go to the video store, with its limited selection of videos, when you could go online and get EVERYTHING? Well, guess what? You can't get everything online. And according to Exstreamist and other sources, you're getting less and less. We pulled September 2016 title counts from uNoGS in the US, showing that there are currently 5,302 titles available in the US Netflix library including movies and TV shows. What this means is that, over the past four years, the Netflix library has collapsed 50% in total title count since its peak four years ago. So if you're signing up for Netflix under the impression that you can see any movie you want, you're mistaken. But you've probably already noticed this, since there are numerous posts saying "Film [X] will no longer be on Netflix next month." Netflix has its reasons to do this, because it is developing its own content, and that is preferable to the company rather than negotiating rights with third parties. But even if Netflix were to change course and go back to hosting 11,000 movies/TV shows again...that STILL would only be a miniscule part of the total content available. According to HTMLGIANT, the total number of movies in 2012 (back when Netflix had about 11,000 movies/shows) was over 268,000. Granted, that's everything - even movies that were never formally released in theaters or on video - but the number still shows that even Netflix has never had more than 5% of the total available content. And because of rights issues, the actual cost of uploading and hosting movies, and everything else, it's very likely that the World Wide Web - at least the legal part of it - will never contain every single movie. So no, you can't have EVERYTHING. For a variety of reasons, relations between the United States and Cuba were dissolved during the early 1960s, presenting certain Americans with an opportunity. Those who were guilty of various crimes. After all, if you were facing prison in the United States, what better place to go than Cuba? It's not like Castro was going to send you back to Kennedy-Nixon land - especially if your crimes could be classified as political in nature. One of the most famous Cuban exiles was Eldridge Cleaver, who fled to Cuba in 1968. Eventually he left Cuba for Algeria, then for France, then for the United States. By 1984, he was endorsing the same Ronald Reagan who revoked his parole in 1968. Time flies. But the Cuban Cubans will see a lot more of the McDonalds breath Americans - and all sorts of other Americans. The decades-old wall between Cuba and the United States is being torn down, and Americans are flocking to Cuba. But as they flock to Cuba, the New Jersey State Police is asking for a little favor. (age 68) was convicted of murdering one New Jersey state trooper and wounding another in 1973. Sentenced to life plus 26-33 years, she escaped from a US prison in 1979 and has been residing in Cuba since the mid 1980s. Both countries have inherent interests, ethical and not so ethical, in allowing Shakur to die of natural causes in Havana. Bringing Shakur to the U.S. may satisfy a whole lot of folks who are outraged because a convicted cop killer is free, but she has little intelligence value to the American government. Releasing Posada Carriles to the Cubans, however, is a whole different story: The guy has had his hands in everything from the Bay of Pigs to the Contra wars. But Shakur/Chesimard is not the only person in Cuba who has run afoul of U.S. law. Some number of exiles are still in Cuba, some of whom arrived by plane. Back in the pre-9/11 days of the 1960s and 1970s, a number of aircraft were induced by hijackers to change their assigned route and go to Havana instead. Of course, there are many other unintended consequences that are occurring as a result of the opening between the two countries. One example - all the dumb Americans who do stupid stuff here and elsewhere can now do it in Cuba. Although in at least one case, it was a Canadian (who has been able to travel to Cuba at any time) who did something dumb. Chris Hughes’ recent trip to Cuba was supposed to be yet another fun travel experience where he could see the local culture and capture some cool drone footage. But thanks to that drone, he instead spent 13 days in solitary confinement in a Cuban jail. But Canada doesn't have the monopoly on stupid. A 70-year-old Cuban-American who has lived in the United States for 40 years was arrested in Cuba for mounting a public Christmas display featuring a giant inflatable Santa Claus and other seasonal characters. His attempt to escape prosecution probably didn't go over so well. “I asked [the state police] to consider the spiritual benefits of this sort of event for children, but they did not listen and threatened me with police action if I did not comply,” he added. Uh, sir, an officially atheist state isn't going to rush to offer "spiritual benefits." I recently read an advice rant from Marcy Massura, who has become frustrated by startup vendors who don't pitch effectively. While Massura's advice is valuable, I got something else out of her rant. What did I get? A statement that rings oh so true. At the start of a call, you are just another start-up with a missing vowel. In an occasional series of blog posts on organizational structure, I find myself often using the Department of Homeland Security (DHS) as an example. Not because DHS is extremely different from all other organizations, but because DHS easily exhibits things that can be found in many organizations, including your own. In short, organizations are not unified entities. The National Strategy for Homeland Security and the Homeland Security Act of 2002 called for the formation of the DHS, which was established to provide a unifying agency for the many national organizations that serve to secure the United States. In that same post, I noted that this dream was just a dream. The post discussed the resignation of DHS' Chief Information Officer Richard Spires, in part because the constituent agencies within DHS didn't want an overall CIO over everybody. The DHS OIG report found that USCIS “improperly delayed HSI agents from conducting a lawful and routine law enforcement action.” The HSI agents waited 20 to 30 minutes in accessing the USCIS building because the USCIS field office director incorrectly asserted that she had authority to determine who could and could not enter the building. The report states that the HSI agents should have been allowed to enter the building immediately after they had identified themselves and explained their purpose. The USCIS field office director incorrectly asserted that USCIS policy prohibited making an arrest or detention at a USCIS facility. Which brings us to the Senate and to the House - or Congress, which created the Department of Homeland Security and has oversight over it. Surely Congress can straighten things out, can't they? Well, a more recent report suggests that Congress is dysfunctional - and I'm NOT talking about the divisions between Republicans and Democrats. The co-chairs of the Blue Ribbon Study Panel on Biodefense said in a statement that the “current congressional oversight structure is severely fractured, resulting in reactive policymaking that threatens America’s ability to combat biological threats." In preparation for the organization of the 115th Congress, the co-chairs of the panel wrote Rep. Pete Sessions (R-TX), chair of the House Committee on Rules, asking that special consideration be given to the jurisdiction of the House Committee on Homeland Security regarding biodefense and security. The authors noted that two independent, bipartisan review Commissions – the Kean-Hamilton 9/11 Commission and the Graham-Talent WMD Commission – called for a more centralized oversight structure in Congress to provide a greater focus on national security programs. I'll get back to this in a minute, but first let's see what the biodefense panel said. “While the House did create the Homeland Security Committee in response to the 9/11 Commission recommendations, jurisdiction of the agencies that were moved to the DHS remains with other committees,” their letter to session said. On the one hand, the blue ribbon panel has a good point. How can we expect DHS to behave in a unified fashion when its work is being authorized by more than 20 different congressional committees? But on the other hand, why was the panel itself called the panel on biodefense? Why wasn't it called the panel on homeland security? They pretty much are saying that they care about biodefense and that's it. In the same way, the 9/11 Commission probably didn't give a hoot about the Coast Guard, and the WMD Commission didn't give a hoot about any DHS stuff not having to do with WMDs. What we're seeing from all sides is a fracturization of purpose - the organization itself is fractured, the Congressional oversight committees are fractured, and the independent panels and commissions are fractured. Rampant fracturization, indeed! Or perhaps not. Fracturization is probably a Department of Energy issue. And here is some text to go with the test. Back in 2010, I wrote about a California realtor named Marilyn Wilson-Rutherford. I actually wrote about her in my music blog, for reasons that are apparent when you read the post. But today I'm concentrating on Wilson-Rutherford from a business sense - noting something that she does that smart salespeople do. As part of what she does, Wilson-Rutherford provides helpful information to potential homeowners. This is a common service provided by realtors and other real estate agents; the realtor who helped me buy my home, Jeannette Ewing, also provides this information (in paper form). In most cases, neither Wilson-Rutherford nor Ewing actually write the helpful hints that they provide. They get them from companies with which they are associated. But they still have to put their name behind them, and therefore take care regarding what is said on their behalf. Since both of them have been in real estate for decades, this is especially critical. When you're trying to make a sale, you can take a short-term approach or a long-term approach. Both of these realtors are obviously in it for the long haul. An example from Wilson-Rutherford's blog will suffice. Now if a real estate agent is going for short-term business, you'd expect the agent's blog to be filled with stories such as "Yes, you can buy that house. Just put the down payment on your credit card!" But a recent Wilson-Rutherford post takes a decidedly different approach. Its title? "America's Most Competitive Renters: Why Many Are Choosing To Rent." That's not the way to get the quick sale. Across the country, young adults are waiting longer to buy homes, no matter where they fall in the income and credit brackets. They are also delaying marriage and starting families – events that often precipitate a home purchase. In many cases, these renters are also paying off student and credit card debt. Some may have graduated college during the Great Recession and are working their way through lost earning power. However, some people are choosing to rent, even if they are qualified to purchase a home, as it allows for a flexible lifestyle. They want the option to be able to move for a job or perhaps they are attracted to a hip location full of amenities. But, even if a renter has the salary, credit and down payment in order, a lack of housing inventory may be the driving factor in continuing to rent over buy. New research found that areas with the most qualified renters also have the fewest homes for sale, which is especially true of areas with strong job markets. So why would Wilson-Rutherford (or Zillow, who actually wrote the story that Wilson-Rutherford posted) actively promote such a downer for the home-buying crowd? I can think of at least two reasons. First, this helps to educate her clientele. If someone is looking to buy a home in the Westside and inventory is low, Wilson-Rutherford can explain that to her clients. The second reason relates to long-term planning. Maybe these millennial couples aren't looking to buy a home in 2016, but what if they pay their loans off in 2018, have a kid on the way, and are THEN ready to plant roots somewhere? Perhaps they'll remember that helpful realtor who provided good information on her website. That's why Wilson-Rutherford provides that information on her website. And that's why Ewing mails that helpful information to me. It's been years since I've seen seen her in person, but if I ever decide to sell this house, she wants to make sure that I remember her.